taken the day before his death. Johnny Allen Hendrix was born on November 27, 1942 in Seattle, Washington USA. His mother, Lucille Jeter, is only 17 years old and his father, James “Al” Hendrix, is in the US army and is stationed in Alabama. Al decides to change the name of his son 4 years later for James Marshall Hendrix. At the age of 15, a few months after the death of his mother, he receives his first guitar (an acoustic guitar). One year later, he receives his first electric guitar and joins a band, The Rocking Kings. After a short presence in the army, where he meets Billy Cox who was going to be his bass player later, he goes on tour for a series of shows between 1962 and 1965 with local groups and as a touring musician for several rhythm & blues artists like Little Richard, The Isley Brothers, Jackie Wilson, Ike & Tina Turner, The Impressions and Sam Cooke. He’s also a part of Curtis Knight & The Squires with which he participates in a recording session which will be issued only in 2000 on the album Knock Yourself Out. In the summer of 1966, he’s discovered by Chas Chandler, former bass player for The Animals, whereas he’s performing at Cafe Wha? in New York City with his band Jimmy James and the Blue Flames (which included also guitarist Randy California who was going to be later a part of Spirit). Chandler becomes his manager and brings him in England where he discovers the stammering of the psychedelic movement. He changes the appellation of his first name for “Jimi” and forms a trio, The Jimi Hendrix Experience, with bass player Noel Redding (born on December 25, 1945) and drummer Mitch Mitchell (born on July 9, 1947 and a former member of Georgia Fame's Blue Flames). One week later, they do a 4-evening mini-tour supporting Johnny Hallyday in France. The Jimi Hendrix Experience was going to record 3 albums in one year and a half (in 1967 and 1968), the classics Are You Experienced?, Axis: Bold as Love and Electric Ladyland. On October 23, 1966, The Jimi Hendrix Experience records its first 2 songs, “Hey Joe” and “Stone Free”, at the studio De Lane Lea in London. “Hey Joe” is released in England on December 16 and it reaches number 4 of the charts. The following single, “Purple Haze”, reaches number 3 and their first album, Are You Experienced?, remains close to the top of the charts in the summer of 1967. On June 18, 1967, Hendrix performs at the international pop festival of Monterey. Brian Jones of the Rolling Stones presents him as one of the most exciting performers he could hear. At the end of his performance, he burns his Fender Stratocaster which he adores and which he even just finished painting that day, as if he offered it in sacrifice. That evening, The Jimi Hendrix Experience becomes one of the most popular rock ‘n’ roll bands. On December 1st, 1967 (January 15, 1968 in the United States) is issued the album Axis: Bold as Love. In February 1968, Hendrix and his band go to the United States for a huge tour beginning at the Fillmore in San Francisco. On February 12, Jimi goes back to Seattle for a concert at the Center Arena in front of his family sitting in the first row. On October 18, 1968, Jimi releases his own version of “All Along the Watchtower” of Bob Dylan, one of the artists who inspired him the most. One week later, the double album Electric Ladyland, recorded in the United States and in England, is issued. It will become their first number 1 album in the United States. On February 24, 1969, The Jimi Hendrix Experience gives its last concert in England at the Royal Albert Hall in London. On June 29, at the pop festival in Denver, Colorado, it’s the last presence on stage of the trio before their split-up, whereas they’re at the top of their career. Between August 15 and 18, 1969, it’s the Woodstock festival in New York state, a festival which was going to put a mark on the hippie movement in America. 450.000 people attend the event presenting some of the biggest hippie artists of the moment. In addition to Jimi Hendrix, one could see and hear Joe Cocker, Arlo Guthrie, Jefferson Airplane, The Who, Janis Joplin, Sly and The Family Stone, Ravi Shankar and Country Joe McDonald. Hendrix presents his new group, Gypsy Sun and Rainbows, formed of his old friend Billy Cox on bass, Mitch Mitchell on drums, Larry Lee on rhythm guitar and Juma Sultan and Jerry Velez on percussions. He begins his performance at 7:30 a.m. and his version of “The Star Spangled Banner” (the US national anthem) becomes the strongest moment of the festival. On December 31, 1969 and on January 1, 1970, The Band Of Gypsys, a trio formed of Hendrix, Cox and drummer Buddy Miles gives 2 concerts at the Fillmore East of Bill Graham in New York City. On April 28, 1970, the band begins the tour The Cry of Love at the Los Angeles Forum, with Mitch Mitchell back on drums. In the summer of 1970, the band starts to work on a new double album, First Rays of the New Rising Sun, which won’t be finished before 1997. The trio participates to several festivals and the last will be the Love and Peace Festival in Puttgarden, Germany on September 6, 1970. On September 16, Jimi takes part of a “jam” with Eric Burdon and War at the Ronnie Scott's Club in London, his last performance. 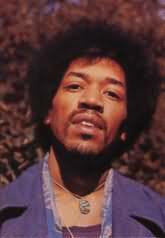 On September 18, 1970, Jimi Hendrix is found dead in his sleep at the Samarkand hotel in London. He dies of suffocation caused by the inhalation of his vomit, following intoxication with barbiturates. He’s only 27 years old. Copyright © 2002-2015, Musicomania.ca. All rights reserved.